OneTap Photobox turns your iPad into a photo booth of the next generation. Ideal for wedding photographers who want to expand their portfolio or for companies and businesses that want to promote their products or events professionally. Be inspired and download the app for free from the App Store. Turn your iPad into a photo booth of the next generation. Why spending a lot of money for other hardware, with your iPad and our App you got everything you need. If you are already a wedding or event photographer – this is how you can expand your portfolio. Offer an addition service with your own photo booth. Your customers will be thrilled. Take advantage of the possibilities of OneTap Photobox to promote your event or brand. An additional way to create an attraction for you, your event or your brand. 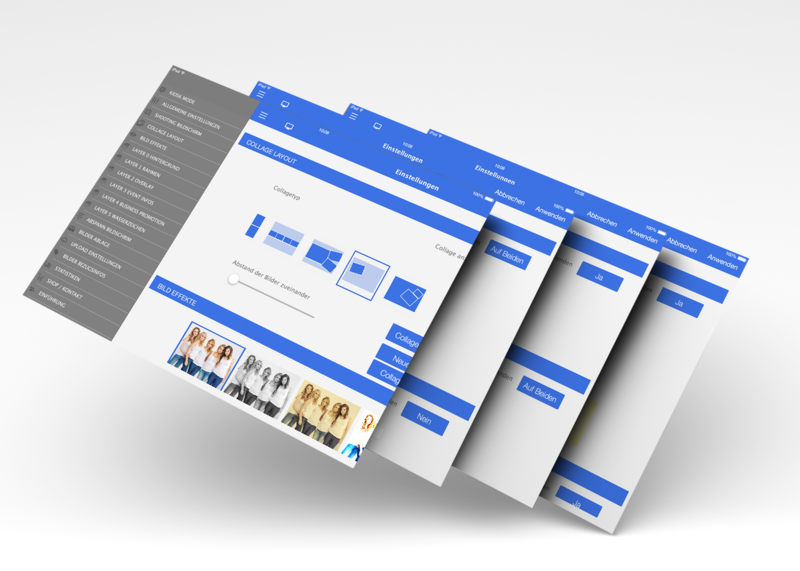 The app offers a variety of options to customize the layout. background, collage style, overlays and more. By importing transparent images from camera, photo tray or URL are the design options are unlimited. Images can be uploaded to a server of your choice in real-time or saved on the iPad. From there you can use other print or share services and make the images immediately available to your audience . OneTap Photobox is now available on the App Store. With OneTap Photobox your guests will enjoy the possibility to create funny pictures for you the whole evening . In Kiosk mode, the app runs completely independently. You will be amazed what kind of images you get in such a relaxed atmosphere without being interfered by a photographer.. With a little skill, you can also create layouts that you can use as a page or inlet for your guest book immediately. Are you planning an event and want to give your guests the opportunity to take some unforgettable images back home?. No matter whether it is a concert, a highschool ball, a birthday party or whatever. Countless Application Areas – endless possibilities – with OneTap Photobox your creativity gets no limits and you can move your event one step further. You are with your product at a trade show, have a business event planned? With OneTap Photo Booth you can stand out from the crowd.. In the app slideshow, you can advertise your products, get in contact with your clients and much mire. So the next event will be a success for you. You decide the look and feel of the app at your event. Welcome Screen, Start-Button, Layout, Design and number of images taken…You set it up and OneTap Photobox is doing the work four you. With a myriad of features and design possibilities it is totally up to you. Make the App look like yours! Use the build in the layer technology to define the background, the collage layout, borders, transparency overlays, event infos, watermark and more. Just as you are used to do in your professional image-editing software. You can use your footage from both. Camera as well as from the internal iPad photo tray. Also an import function via URL is available, and thus you can access all the resources from the web. As a professional you create your artwork in advance on a PC or Mac and import it into OneTap Photobox. Thus, your creativity has no limits at all. Apply transparent overlays by using png files..
Download the app for free from the App Store and test all the features of the app. The free version is different from the Unlimited Full Version only by a watermark and logo in the saved images. If the app meets your needs, we would be delighted if you go for the full version. If you have questions, please see our video tutorials or contact us – we will answer your request as soon as possible. You can also request for a new feature or call us if something does not work as expected. We have an open ear for your request. You want to be informed about updates and new features? Then please sign up for the newsletter. We like to keep up to date. The website photobox.e1itconsult.com is operated by E1ITConsult e.U. E1ITConsult e.U. is a registered Austrian enterprise developing software and tools.